This is a new Generation of SD System Nawigator. Given device is a full-fledged portable User Interface with a possibility of measurement and indication more than 60 System parameters. 40 Multifunctional Programmable Shortcut Buttons with Right Click Context Menu and built-in Windows XP Control allow you to manage of any processes in your computer. 1. Optimized the main control script for speedup of Gadget functioning and minimization of CPU and RAM usage. 2. Improved Graphics and Ergonomic Design. 3. Improved the scripts of Shortcut Buttons and added 12 such Buttons. Hope you'll find this device useful. * Before use this device install please the "hoog0555_cyr2.ttf" and "digital.ttf" fonts from System Navigator zip-file to your computer. This is just about the neatest thing I have ever seen and I havent even explored it all yet WOW! One issue I have found. When this widget is loaded, my 3.5 floppy drive makes grinding noises until I either put in a disk or unselect "computer" or "drives". Now that's what I'm talkin 'BOUT!! I get grinding too. Very unpleasant bug. Apart from that it is amazing- please fix the bug and I'll use this 24/7! i also have the grinding but i found a little spelling mistake, in the launch bar when u right-click to modify a shortcut it says "Raname Shortcut"
otherwise wow this thing has everything! Cannot this get to install...I get a message that says this is not a valid format??? To FlaK_MoNKeY: A spelling mistake is already corrected. Sorry for my bad english. To Citizen zObelisk, Citizen kin242, FlaK_MoNKeY: This noise appears when Navigator tests all drives and retrieves system information about their conditions obviously. I have no Floppy drives in my computer so I have not noticed to this noise... Today I'll try forbid the Gadget to test a Floppy drives or use the other method of retrieving the information about logical drives. Much hope that you do not hear this noise already tomorrow. To Citizen JohnnyPants: Much sorry, but I do not know as to help you at the present time. I did not make the program which install this Gadget. To create the Gadget I use DesktopX Pro... Can you send me by E-mail full-text of this system message and information about your computer configuration? Then I'll be able to try help you. Hi Friends! Excuse me for some inconvenience. All discovered bugs are already corrected (hope there are the last bugs...). Vad, ??. ???? ???????????. I hope my new toy translator got it right: "Thank you. Most impressive". What a lot of coding you must have done on this!! You have way to much time. But im glad you do, because this is realy cool. Also can you post it as a widget so i can play, and try to figure out some of the stuff you made. The best widget I've used. Congrats, and thanks for sharing. After using this for a while, it's still the most fantastic tool Ive ever seen. My only criticism is the FONT. I find it very difficult to read the text, and for the life of me i cant figure out how to try a different font. I have used the desktop x builder thingy, and cant access the master file to change any fonts. But its still a great thing, and you have my admiration. 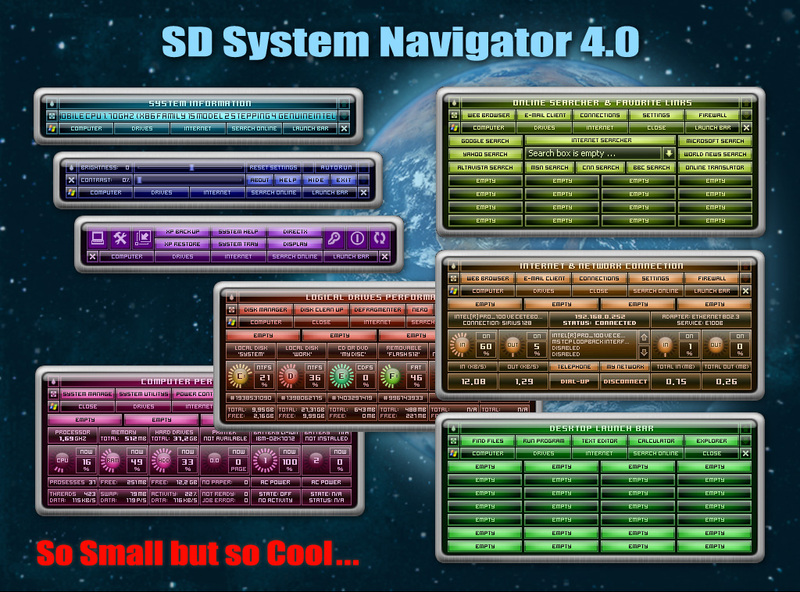 This is I think the most comprehensive and best widget yet released....something like this really shows just what DesktopX was created for...I can see you put alot of thought and time into this...its supurb. Was wondering if you could post it also as an Object in the 'Dektop Object' section, as I too have some difficulty on reading the font and would like to tweak that elemant and perhaps tweak the outer shell color as I would like it darker to match the dark skins I generally use. What an impressive piece of work. I am glad you fixed the Floppy Drive bug. Everything seems to work very well. There is one small problem I noticed however and I thought you should know since I haven't seen it listed here, and that is: When the Navigator is on the desktop in it's closed position, it pegs my processor at 100%. When I open the lower window, my processors drops to normal levels. I hope you continue your amazing work as I believe your great talents will soon pay off. I know about this problem. In this situation is guilty System Information Scrolling Text. More exactly - calculation of its current coordinates... I have one idea and I'll try realize it Today. If the results will be positive I'll send Update to the Wincustomize Tomorrow. Just have to say this is the coolest widget ever! Can't imagine the work you put into it. I am running 1024x768 and I have a hard time reading most of it. Is there some way to enlarge it? Are you going to make it in another resolution?